Robert Funnell was born in 1889 in Brighton. He died on the 21st of March 1918 in France. at 29 years old. Robert was in the Royal Sussex Regiment 11th Battalion. His rank was acting Lance Corporal, service number was SD/3842. Robert’s father Robert Funnell was born in 1857 in Danehill, Sussex, the son of William and Mary Funnell and the seventh of nine children. He married Jemima Eager in 1879 at St Peter’s Church in Brighton. In 1881 they lived at 9 Frederick Gardens with their daughter Jemima aged one and George Taylor, who was a ‘carriers carman’, lodged with them. Robert, also worked as a ‘carriers carman’. In 1882 their daughter Emma Mahala was born, followed by Alice in 1886/88 and Robert Trainton in 1889. In 1891 the family lived at 6 Queens Street and Robert senior worked as a ‘carman’. The 1901 census showed the family home was still in Queens Street, and two boarders also lived there, but daughter Jemima who had married Harry Barker in January 1901 lived in Trafalgar Street and her sister Alice was possibly working as a servant in London. The 1911 census showed Robert was, like his father, working as a ‘carman’, and he and his parents had moved to 7 Foundry Street. Arthur Montgomery, a boot and shoe salesman boarded with them. Robert’s father died in 1916 aged 59 years. In 1918 his Mother lived at 28, Newtown Road, Hove. Robert enlisted with the Royal Sussex Regiment 11th Battalion, his service number is SD/3842. He was killed in action during the German Spring offensive sometime between 21 of March 1918 and 3rd of April 1918. He is commemorated on the Pozieres Memorial in France. He was posthumously awarded the Victory Medal and the British War Medal. His effects were sent to his Mother in August 1919. Robert’s Mother died in Worthing in 1936. Little information about Robert’s military career appears to have survived. From the 1911 census the Funnell name has been transcribed as Tunnell. Various branches of the Funnell Family have researched their history and much information can be found on the Funnell’s Wood website. 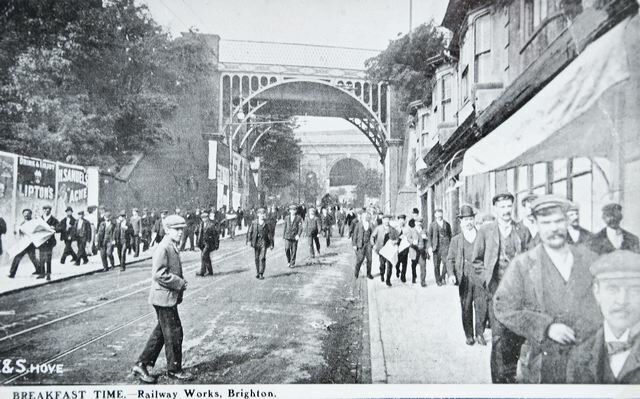 Queen Street was demolished to make way for a coal shed, which was opened in 1905 as part of Brighton Railway Station. The Hall Genealogy Website states that a carman is a driver of (horse-drawn) vehicles for transporting goods. Carmen were often employed by railway companies for local deliveries and collections of goods and parcels. Lance Corporal SD/3842, 11th Battalion, Royal Sussex Regiment (1st South Downs). 39th New Army Division. Killed in action during the German Spring offensive 3rd April 1918. Aged 29. Born and enlisted in Brighton. Next of kin, Brighton. Listed in St. Peters Memorial Book under L/Cpls. Commemorated on The Pozieres Memorial MR. 27. Sydney Barrow was born, 13th October 1885 at Berwick, East Sussex. He died on the 11th October 1962 in Brighton. At the age of 77 years. His Regiment was the 2/1st Sussex Yeomanry and his rank was Acting Corporal, Service number: 171267. His profession pre-war was Brighton Borough Police Officer and his profession post-war was Bailiff at Brighton County Court. He married in 1919 to Nellie Durden in Eastbourne. Sydney Barrow was born 13th October 1885 in Berwick, East Sussex where his ancestors appear to have lived for several generations. Sydney was the younger brother of Herbert who was born in 1884. Sydney and Herbert attended Berwick School. The picture below shows the two boys with their parents Frederick and Ellen. Sydney is on the left. By 1901 Sydney was working on a farm as a worker. He is still living in Berwick. On 11th March 1908 Sydney became a Police Constable with the Brighton Borough Police Force. It is not known where he was living at the time but within the 1911 Census, three years later; it is revealed that he was living with his Uncle Benjamin John Woodall at 41 Kings Street, Brighton. Woodall had married Isabel Barrow. The Military records are very sketchy for Sydney Barrow, only two documents have been found. Upon the two WW1 Plaques within The Old Police Museum Cells at Brighton, Sydney appears to be with two units, The Sussex Yeomanry and The Northumberland Fusiliers. Sydney Barrow received permission from Chief Constable William Gentle to join the Army from the then Chief Constable Mr. William Gentle on 19th May 1915. He left the Police on the same day and according to the “Silver Badge” records attested to join the Army the same day. Herbert Boxall, Thomas Ford, Ernest Griggs, Henry Hayter, Charles Moorey and George Sutton. The first record from the UK, WW1 Service Medal and Awards Rolls, 1914 -1920 shows that he qualified for the British War Medal along with the Victory Medal. He was Acting Corporal in the Sussex Yeomanry and his service number was SY 171267. The medal form which is dated 1920 also shows Sydney as a Lance Sergeant with the Northumberland Fusiliers, service number 237027. Within the Silver War Badge Roll transcription held at ‘Find my past‘ an entry is found which records Sydney as having enlisted on 19th May 1915. At some stage unknown he received a Gun Shot wound and was discharged from the Army due to injury on 13th December 1918 aged 33yrs as a Lance Sgt. Sydney was awarded a Silver War Badge number B/65986. Kathleen Mary Barrow born 25th April 1920 Brighton. Norah Phyllis Barrow born 19th December Brighton. Audrey Ellen Barrow born 1924 Brighton. Hilda A Barrow born 1927 Brighton. Sydney died in Brighton on 11th October 1962 aged 76 years at Brighton General Hospital. Probate register shows that he was still living at 187 Ditchling Road. Nellie Barrow died on 7th August 1981 aged 90 years. The only research problem was a lack of army service records. Copyright Researched and reported by Ian Borthwick 2017. Retired Sussex Police Officer AB579. Served between Nov 1976 to March 2007. Charles Edward Ball was born in 1882 in Hastings Sussex. He died on the 3rd of September 1916 in Beamont Hemal, France at 29 years. His Regiment was the Royal Sussex Regiment, 13th Battalion. His service number was SD/3521. His profession before the war was a barman. 1901 Census shows that Charles’ mother Jane had re-married to a Jerimiah Delay. The census therefore shows Jane’s children with the name Ball. Lance Corporal Charles Ball fought at Ferm Rue De Bois where he earned a Military Medal for bravery. He survived this battle and was sent to Beaumont Hemel where he died in action. ‘At Preston Barracks in Lewes Road Brighton 700 hundred people were present when Col Rodmell awarded to Lance Corporal Charles Ball’s widow with her small son Bernard present, a medal for bravery. I was unable to find a military record for Charles Ball and assume this was destroyed in a fire with many others. It was also impossible to trace his Regiment to The Battle of Beaumont Hemel as the record for the regiment ceased in 1916. Therefore it is not known how Charles Ball died. Arthur John King was born in 1895 in Brighton, and lived there with his family, and worked as a Rivet Lad at Brighton Station, Locomotive and Carriage Department. He enlisted as a private to the 6th (Cyclist) Battalion, Royal Sussex Regiment (regimental no. 177) on 12 June 1912, at the age of 17. Arthur died, aged 21, in a bathing accident, at Littlestone on 15 July 1916. He was off duty. Arthur was born in Brighton on 4 February 1895 to Samuel and Jane King who had 12 children in all, 5 of whom had died by 1911. Although Samuel was born in Brighton, he lived in Plymouth for some time, marrying a Devon girl, Jane Philp, in 1885 at the age of 29. By the time of the 1891 census, still living in Plymouth, the couple had 2 sons and 2 daughters. Shortly afterwards, Samuel moved back to Brighton with his family and by 1901 had a further three children, including Arthur (1895) and his younger brother, Alfred Cornelius King (1899), who also served in WW1 and is also listed on the plaque. In 1901, at the age of 6, Arthur was living with his family in Hollingbury Road in a property called St Malo and by 1911, they had moved to 22 New England Road. 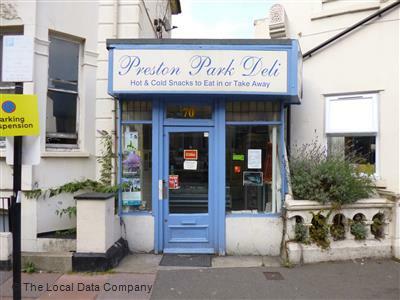 His father, Samuel, a hairdresser, had a salon at 70 Preston Road (now Preston Park Deli) which stayed in the family for over fifty years (c.1911-1969), passing from father to daughter (Ethel Maud King) around the 1940s. He had previously had a salon at 26 Market Street, at the southeast corner of Little East Street, a building which was demolished in 1960. He lived with his parents and four siblings at 22 New England Road. Two of his siblings (Alfred and Emily) were still at school and two older sisters (Helen and Emily) were both dressmakers. Railwaymen streaming down New England Road on their way to a hurried breakfast, in 1912. They started work at 6 am, and had a break for their breakfast between 8 and 8.30. Most of the men lived quite near to the Works, in such streets as Argyle Road, while others lived in Railway houses in adjoining roads. Arthur had joined London, Brighton and South Coast Railway on 17 August 1910, aged 15, as a Rivet Lad at Brighton Station, Locomotive and Carriage Dept. At the age of 16, Arthur was described in the 1911 census as an apprentice boiler rivetter. By the time he enlisted in 1912, aged 17, he was describing himself as a maker. Arthur was enlisted as a private to the 6th (Cyclist) Battalion, Royal Sussex Regiment (regimental no. 177) on 12 June 1912 and was mobilized after training on 5 August 1914. His medical inspection report on enlistment described him as 5 feet 4 inches tall, with a chest measurement of 34 inches. He was appointed (unpaid) to the rank of Lance Corporal on 30 September 1915, to (paid) acting Lance Corporal on 30 December 1915, and promoted to Acting Corporal on 14 February 1916. His total service, till his death on 15 July 1916, was 4 years and 35 days. The 6th (Cyclist) Battalion, Royal Sussex Regiment was formed in 1912 and was one of 14 cyclist battalions at the start of WW1. They were part of the Territorial Force (TF), the volunteer reserve component of the army in existence from 1908-1920. The TF was seen as a home defence force, the cyclist battalions being employed largely on UK coastal defences. At the end of WW1, the TF was reformed and renamed the Territorial Army. Like others in his battalion, Arthur did not see any service overseas, and at the time of his death, he was NCO in charge of the Lookout Station at Littlestone, Kent. to the water. An inquest recorded a verdict of accidental drowning. at 24 Herbert Road, Brighton. In 1891 the Sambucci family was living in 4 rooms at 16 Spa Street, Brighton. Spa Street was demolished in the late 1890s under a slum clearance scheme, and replaced by Tillstone Street, which runs from Park Hill at the bottom of Queen’s Park to Eastern Road. Sometime before 1901, the family moved to Ivory Court in Ivory Place, where Albert spent much of his life. Like other immigrants of Italian descent in Brighton, the Sambuccis set up an ice cream business. At the time of the 1911 Census, the Sambucci family were living in 4 Ivory Court (listed as having 3 rooms). Albert was aged 19 and living with his two younger sisters, Clara (aged 13) and Nellie (aged 9). His mother is recorded has being head of the family and the father’s name is crossed through. This could indicate that he had died or was no longer living with the family, or in another house nearby, as other Sabuccis are listed on the same census on the same street (Ivory Court). There is also a Loreto Sambucci recorded as living in Lewes during the 1911 census too. In 1911 the census form was completed by the residents of a property and later checked by an enumerator. Interestingly the form for 4 Ivory Court was completed and signed by Albert’s elder brother, Joseph Sambucci, who didn’t live there. Joseph’s postal address beneath his signature isn’t clear. It looks like he wrote 2 Ivory Court and changed the “2” to a “4”. However, he was actually living close by at No 1. Ivory Court. Why did Joseph fill in the form? Perhaps his parents weren’t literate or maybe their command of English wasn’t good enough and they required their eldest son to complete the form for them. However, another strange feature of the 1911 census form is that Loreto’s name was crossed out in red by the enumerator and he was not included in the totals at the bottom of the form. This suggests that he wasn’t actually living on the premises and that maybe he had been included by mistake. Florrie was listed – again in red ink – as head of the family. In fact the reason why Joseph completed the Census form for his mother and the explanation for Loreto’s absence is rather a startling one and can be found in London Daily News of March 25th 1911. The paper reported that Loreto had been charged with being drunk while in possession of a loaded revolver and he was sentenced to one month imprisonment. As the deadline for the Census return was 2nd April 1911, he would have been in prison when the Census was taken, which is why the enumerator would have crossed out his name. A previous census recorded Albert has having two older sibilings. His brother Joseph in 1911 Joseph ( aged 24) was living at 1 Ivory Court with his wife Blanche ( aged 22) and baby daughter Margareta (3 months). His sister Mary (or maria) is not listed and must have had alternative lodgings. She married John Wilcox in 1921 and also lived at Ivory Place with her own family in the 1920’s. In 1911 Joseph Sambucci (24) is living at 1 Ivory Court with his wife Blanche (22) and baby daughter Margareta (3 months) Joseph was born in Brighton & Blanche came from Middlesborough. They had been married for 2 years with the one child in 1911. Joseph is listed as an employer & his business is Ice Cream Manufacturer – run from home. Blanche is a boarding house waitress. Ivory Court was off Ivory Place, which runs parallel to Grand Parade between Morley Street and Richmond Parade. This area of Brighton was a slum area and the courts often contained the worst housing in the town. Ivory Court was on Ivory Place, which runs parallel to Grand Parade between Morley Street and Richmond Parade. This area of Brighton was a slum area and the courts often contained the worst housing in the town. The Sambucci family seems to have occupied several of the tenements in Ivory Court. No. 4, where Albert lived, only had 3 rooms, which, although not unusual at the time, may have made it a bit crowded. In 1911 Joseph was listed at living at No. 1 Ivory Court and Albert’s father, Loreto was listed in the 1901 Census and a 1902 street directory as variously living at number 2 and no 4 Ivory Court, so it is possible that, over time, the family rented several of the tenements in the court and spread themselves across the properties. In 1912 Albert married Virginia Panetta, from Lewes. Virginia was born in about 1895 in Italy but was now resident in the UK. She lived at 3 Malling Street with her Mother Maria Panetta, who was 40 years old in 1911 and head of the family. Virgina had a sister Emilia, who was 13 in 1911 and a brother Eugenie, who was 7; both of them went to school. Also living at the house was 61 year old Benedette Panetta, who is described as a general servant and domestic worker. Interestingly Emilia was born in Dundee and Eugenie in Broughty Ferry (a suburb in Dundee), so the Panetta family must have moved down from Scotland in the previous 6-7 years. On the 1911 Census Maria and Virginia’s occupations were shown as “assisting in business”. Maria was also described as “employer” and the 1911 Kelly’s Sussex Street Directory lists her as a confectioner. When Virginia married Albert she was 17 years old and he was 19 or 20. From Albert’s War Record it looks like they set up house at 3 Ivory Buildings, round the corner from his home in Ivory Court. On the 1901 census Loreto Sambucci is recorded as being an ice cream vendor. On the 1911 census the family business continues to be listed as an Ice Cream Business. Albert and his mother Philiomena are listed as assisting in the business and Albert’s older brother Joseph as being an employer and ice cream manufacturer, and was possibly head of the business as a result of his fathers absence. The ice cream business is recorded as being run from home and the ice cream sold on the beach front. The opportunities offered by the holiday industry also encouraged a proliferation of small and miniature businesses, the ‘penny capitalism’ that flourishes in this kind of setting. In the 19th century, ice cream manufacture was simplified with the introduction of the ice cream machine in 1843 in both England and America. This consisted of a wooden bucket that was filled withice and salt and had a handle which rotated. The central metal container, containing the ice cream was surrounded the salt and ice mixture. This churning produced ice cream with an even, smooth texture. Previously it was made in a pewter pot kept in a bucket of ice and salt and had to be regularly hand stirred and scraped from the side of the pewter pots with a ‘spaddle’ which is a sort of miniature spade on a long handle. The key factor in the manufacture of ice cream was ice. Where was it to come from? In the early 19th century importation of ice started from Norway, Canada and America, this made ice cream readily available to the general public in the UK. Ice was shipped into London and other major ports and taken in canal barges down the canals, to be stored in ice houses, from where it was sold to ice cream makers. This burgeoning ice cream industry, run mainly by Italians, started the influx of workers from southern Italy and the Ticino area of Switzerland to England.In London they lived in the most appalling conditions in and around the Holborn area. The huge ice house pits built near Kings Cross by Carlo Gatti in the 1850s, where he stored the ice he shipped to England from Norway, are still there and have recently been opened to the public at The London Canal Museum. A photograph taken on Brighton’s seafront near the Free Shelter Hall around 1910 showing a woman holding a child and offering “pure ices” and ice cream from a barrow. On the sides of the barrow are painted the words “Pure Ices” and “Hokey Pokey” ice cream. Carlo Gatti is credited with being one of the first to offer ice cream for sale in the streets of London. Carlo Gatti employed his fellow countrymen to take his ice cream around London streets in insulated barrows. They offered small sample of the ice cream wrapped in waxed paper by calling out “Ecco un poco“, which roughly means “Try a little“. The Italian phrase “ecco un poco” sounded something like “hokey pokey” to London ears and the ice cream vendors became known as “Hokey Pokey” men. The ice cream itself gained the nickname “Hokey Pokey“. A photograph taken near the Free Shelter Hallon Brighton’s seafront around 1910 shows a woman holding a child and offering ice cream from a barrow. On the sides of the barrow are painted the words “Pure Ices” and “Hokey Pokey” ice cream. Before the introduction of edible cones in the late 1880s, ice cream was served from the barrow in a small glass cup called a “penny lick”. The purchaser of the ice cream would lick the ice cream from the glass and return it to the vendor. The glass would be wiped clean with a piece of cloth and then filled with ice cream for the next customer. Customers who did not want to eat the ice cream standing at the barrow could take the ice cream away after having it wrapped in waxed paper. Carlo Gatti and Battista Bolla invited their relatives and other Swiss-Italians to join their thriving catering businesses in London. Hundreds of Swiss-Italians emigrated from Ticinoto London in the second half of the nineteenth century. Ticino had a growing population but only a small amount of good farming land. Unemployment was high and during the series of poor harvests between 1847 and 1854, a large number of Ticinesi left their nativeSwitzerland for other European countries and North America. [The local council in Ticino actually paid a lump sum (equal to six months’ wages) to working men in order to encourage them to leave Ticino]. The prospect of finding paid work in the Swiss-Italian cafes an restaurants that were springing up in London, encouraged a further exodus of emigrants from Ticino in the latter half of the nineteenth century. By the late 1870s and early 1880s, Swiss-Italians who had found work as waiters, barmen, pastry cooks and confectioners in London migrated to expanding seaside towns such as Brighton. Albert Sambucci enlisted in the Royal Sussex 11th Battalion for a three year term, or until the end of the war, in September 1914 in Hove, East Sussex. In records, he is listed as both L/Cpl Albert Sambucci and also as Private Sambucci in TheyservedWiki & the Commonwealth War Graves Commission (CWGC) with either of these enlistment numbers: SD/3144 or 3444. 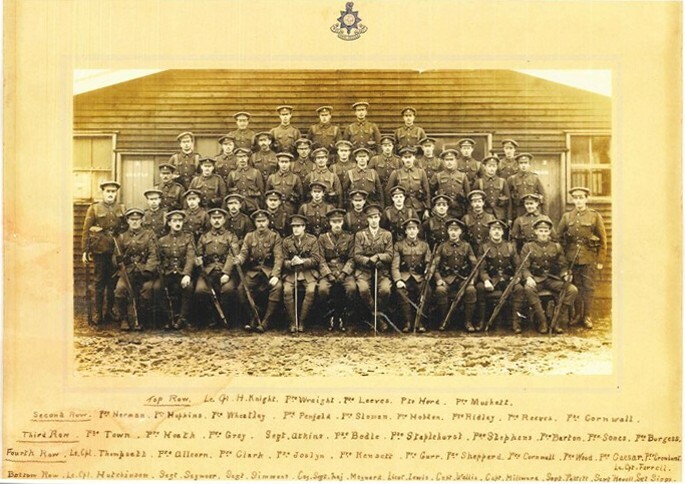 Most sources agree SD3444 in the Royal Sussex Regiment – 11th Battalion. At one time, the village of Cambrin housed brigade headquarters but until the end of the FirstWorld War, it was only about 800 metres from the front line trenches. The village contains two cemeteries used for Commonwealth burials; the churchyard extension, taken over from French troops in May 1915, and the Military Cemetery “behind the Mayor’s House.” The churchyard extension was used for front line burials until February 1917 when it was closed,but there are three graves of 1918 in the back rows. The extension is remarkable for the very large numbers of graves grouped by battalion, the most striking being the 79 graves of the 2nd Argyll and Sutherland Highlanders and 15 of the 1st Cameronians (Row C), the 35 of the 2nd Royal Welch Fusiliers and 115 of the 1st Middlesex (Row H), all dating from 25 September 1915, the first day of the Battle of Loos. and 1 Belgian burials here. The cemetery was designed by Charles Holden. Hastings Sinfonia is proud to be part of Somme100 FILM, an international project bringing together 100 live orchestral performances of the IWM film The Battle of the Somme to mark the 100th anniversary of the Battle. The original restored 1916 film, by Geoffrey Malins and John McDowell, with our live performance of Laura Rossi’s new score, lasts approximately 74 minutes. It is not recommended for children under 12. We are delighted that our performance will be introduced by two special guest speakers: Dr Toby Haggith from The Imperial War Museums, and the composer Laura Rossi. Patrick Francis Langton , born in 1897 in Teddington Surrey, was a bricklayer living at 6 Hove Street in Hove, East Sussex, before becoming a Private in the Royal Sussex 12th Battalion 39th Division (service number SD/2370). He died at The Battle of Boar’s Head at Ferme Du Bois France, the deadliest battle for the Royal Sussex Battalion, on the 30th of June 1916, also known as ‘the day that Sussex died’. Patrick Francis was 19. At the time of the 1911 census, Patrick Francis’ parents, John Langton (50 years old), a Cycle Engineer, and his Mother Ada E. Langtono (37 years old) are recorded to have been married for 14 years with three children. Patrick Francis was the eldest at 13 years of age at the time of the census, followed by his sister Madge at 11 years and brother Fredrick at 9 years. The family is recorded to have worshiped at All Saints Church Hove Sussex (parish records not available). Patrick Francis is not recorded to have married. Private Langton was posthumously awarded The Victory Medal and The British War Medal. He enlisted in the British Army on 15 March 1915 in Hove Sussex. The following extracts depict the events of The Battle of Boar’s Head that lead to Patrick Francis’ death. ‘On 29th June 1916 ‘Two companies marched for Richburg and Vielle Chapelle and joined the rest of battalion in the front line at Ferme Due Bois. (The Battle of Boar’s Head) Artillery bombarded enemy trenches from 2pm to 5pm. 12th Battalion attacked enemy front and support lines and succeeded in entering same. Operation orders were attached to the diary. The battalion was relieved by the 14th Hants at 10am and marched to Les Lobes after resting at Richburg. ‘We paraded to go over the top the next morning. We said the Lord’s Prayer with our chaplain who addressed a few words to us and gave us a blessing. All night we were hard at work cutting the barbed wire in front and carrying out bridges to put over a big ditch in front of our parapet. Patrick is Commemorated alongside the other Hove Residents who Fell during The Great War on The Hove War Memorial, the Hove Library Great War Memorial, and the All Saints Church Memorial plaque, the same church his family is recorded to have frequented. ‘Patrick was one of the many casualties in the unsuccessful attack by the 116th. Brigade on The Boar’s Head, near the Rue De Bois at Richebourg. It was a hastily planned action designed to distract the Germans from the main Somme Offensive on 1st. July 1916. A staggering total of 135 of Patrick’s Comrades from the Battalion also Fell on this day’. This research was completed by Veronica Wright of The Orange Lilies project. The Orange Lilies project aims to highlight the city’s experience of living through The Somme. Through the project, we are gathering and contextualising material and information for city residents, school teachers, researchers and those interested in WWI. It comprise interviews, newspaper reports & other printed items, photographs, objects and documents held at public libraries, museums and the The Keep archive. Part of the project entails finding relatives and family members with photos and memories of people from the city who served during the Somme, or lived in Brighton and Hove at the time of the batyle between 30th June 1916 and 18th November 1916. June is a lovely Hove based lady in her early 90s involved with an older people’s group called Memories Past, who married into the Rayner family in the 1940s. Meeting June Rayner not so long ago, we got talking about her husband who was in Burma in World War II, and then his father a Portslade born man called Issac Rayner who served in the Battle of the Somme in 1916 with the Royal Sussex Regiment. Issac was born in the 1890s and lived in 35 South Street, Portslade village, part of Brighton and Hove in a house that no longer exists. The photo (to the left and right), whilst not dated, was taken in Portland Road (the road joining Portslade to Hove) by H.W Tubb, a well known photographer at the time with an established business in the area. Henry William Tubb’s home in Portland Road also served as his studio and business premises. Henry Tubb was keen to point out in his advertisements that his Portland Road Studio was located opposite Portslade Railway Station. Henry Tubb set up a photographic studio in Portland Road, Hove, around 1899. Describing himself as an “Artist Photographer”, Henry Tubb took studio portraits at his Portland Road Studio, but he was also an “outdoor photographer”, offering to bring his camera along to “Garden Parties, Wedding groups, etc., ..by appointment”. Henry Tubb was also keen to advertise his expertise in making photographic enlargements. Tubb’s advertisements proclaimed “Photographs in all Styles – Enlargements of all Description” and the publicity on the reverse of his cabinet and carte-de-visite portraits, under the heading “ENLARGEMENTS TO ALL STYLES”, assured his customers that “the negative of this photograph is preserved from which enlargements or further copies can always be obtained.” To supplement his photography business, Henry Tubb also made picture frames at his Portland Road premises. (Taken from http://www.photohistory-sussex.co.uk). An advertisement for H. W. Tubb’s Portland Road Studio which appeared in the Hove Gazette on 16th September 1899. Issac (also known as Ike) joined up with the Royal Sussex Regiment at a date unknown during the Somme and became a machine gunner in the trenches there. He suffered inordinately in this time and was buried alive whilst tunnelling, being rescued by army colleagues digging him out. Once recovered from this ordeal, he was sent back to the front, where he was then gassed. From the British Legion website ‘the Battle of the Somme also saw several different weapons being used including mines, poisonous gas and machine guns. Some of the larger machine guns needed 12 men to operate them. The best known innovation of 1916 was the tank, first used in battle at Flers on 15 September 1916. Armoured, tracked vehicles were designed to cross trenches, crush barbed wire and give direct fire support’. Issac Rayner remained in the army until at least the end of 1919. We can’t be sure, but from the photos seen of him in colonial army wear, posed with other Royal Sussex Regimental soldiers also in shorts, and another portrait shot of Issac with a pith helmet, it seems possible that he was part of a Battalion transferred to India in 1917. Pith Helmets were widely used by the British Army in the Middle East, India and Africa to protect delicate British complexions from the fierce sun. In this postcard sent home to his parents, dated 1st August 1919, Issac is pictured second row from the top, third from the left, clearly identified by his large moustache, something he hadn’t had before enlisting or later when he returned home. We don’t know anything further of his time with the Royal Sussex Regiment, only that he did survive the war and his injuries. Many soldiers who survived being gassed in the tranches died very young, so Ike was fortunate in this aspect. Returning to Portslade, Issac met and married Florence Jane Packer in the early 1920s who at the time lived at 6 Crown Road (see right), Portslade, pictured here in the back garden of the house at a date unknown. It isn’t known if they knew each other before the war, however Florence was also from a local Portslade family and had grown up in the house in Crown Road along with her parents (see right – Great Grandad Packer) and siblings. Returning to Portslade, Issac lived until 77, dying at the home inherited by him and Florence from the Packer side of the family at Crown Road, Portslade on 14th November 1962. Florence it is believed was a strict woman, who wasn’t given to smiling too often. She did lose two of her young nephews (Michael and Donald Packer) in WWII. Both sailors, as were many in the Packer family during the second world war. The two men were on separate naval ships which were torpedoed by German boats, so this may be connected. She died much before her husband Issac but it is unsure when. Issac and Florence had two sons, Cyril born in 1922, followed by the younger son Dennis, who was born on 6th of September 1926, and a (possibly illegitimate) niece brought up as a daughter of the Rayner family, named Iris. The photograph below was taken by Stacy Ward, a portrait photographer who took over the business and premises from HW Tubb (and premises moved to 39 Station Road) who earlier took Issac Rayner’s photo in the mid 1900s. The children all married local Portslade people. Issac and Florence lived in the house at Crown Road (near Fishersgate) until the 1960s. Dennis was posted to India during World War II age only 19. Below is a snap of him as a private in Poona (now Pune) south of Mumbai, India. June met and married Dennis Rayner (Issac’s younger son) in the 1940s and they had four sons who all still live in the area. Here she is as a young girl with toy pram, and later, aged around 15 in a portrait photographic shot around the time of meeting Dennis Rayner. June and Dennis were married a long time until Dennis sadly passed away. Here you can see Dennis with two friends at his retirement party in 1991.